Russian women and revolution. October revolution. Russian women and industrialisation, collectivisation. Russian women after October revolution. Russian Women liberation and emancipation. The effects of industrialisation and collectivisation on a Soviet woman. The oppression of women in Russia before 1917 was considered by social critics to be one of the country great injustices Upper- and middle-class women had access to very limited education and employment while most peasant girls never went to school. Women could not separate from their husbands, change their residence, leave the country, take a job or execute a bill of exchange without the permission of a male guardian. Divorce was practically impossible and women had significantly less property and inheritance rights than men. Life and destiny of great Russian mathematician Sofia Kovalevskaya illustrates the state of affairs and the position of a woman in tsarist Russian to the full. Underlying these legal restrictions was a patriarchal value system that granted all men power over the women in their families. Whatever her class a woman was expected to marry a man of her parents' choice and live her life as the dutiful wife of an authoritarian, if sometimes benevolent, husband. She owed her husband complete obedience and was compelled by the state to live with him, take his name and assume his social status. Another difficulty that hindered the complete emancipation of women was the interference of the church. Religion was an important factor in Russian society. Russian Orthodoxy was the state's official religion for many years. The religion believed in patriarchy; men should be the head of their families and had all the power when making major family decisions. The church greatly opposed the idea of women working outside of the home front and these values were common among church goers, which made up the majority of the vast population. October 1917 Revolution reshaped the lives of Russian women for generations. After October revolution in 1917 creating of the Socialist society program had women liberation and equality as its main orientation. Bolsheviks were the first leaders in the world history that created the new society by transforming the basic human relationship - a family, including the ideas and symbols connected with them. They argued that for women to be liberated, they would have to be relieved of their semi-slave status within the family. The decrees of 1917 granted Soviet women total liberation and equal to men civil rights. The outspoken women's rights leaders and ideologists were Alexandra Kollontai and Nadezhda Krupskaya who suggested that the state could eventually meet people's emotional needs and proclaimed the private life and family with its essentials an outdate and even more - a source of social inequality of women. Aleksandra Kollontai was considered to be the main ideologist of women liberation movement and social relationships between men and women. She suggested that the main reason for deprivation of women's rights was their loss of equal industrial labour input for the sake of the society as well as gender division of labour. Kollontai was also trying to architect the news type of family relationship, where the marriage played minority role and was dependant on free choice of a new working woman, liberated of age-long patriarchal burden. The family was supposed to be totally subordinate to the state, its social needs and functions. Actually the family would "wither away", and women would be free to participate in constructing socialism as equals with men. Kollontai believed that motherhood was "not a private matter" and childbirth was "a social responsibility". Passed by the Soviet government between 1917 and 1927 series of laws stroke at the heart of women's oppression. The 1918 Code on Marriage, the Family and Guardianship was the most progressive family legislation the world has yet seen. It recognised only civil marriage which, by 1927 was a simple registration process based on mutual consent, and enabled divorce at the request of either partner. In 1926, de facto relationships were given legal equality. The code abolished illegitimacy and endeavoured to make familial relations independent of the marriage contract. It also abolished adoption as the first step in transferring child care from the family to the state, separated property ownership and inheritance from marriage. All children were entitled to financial support when their parents separated, and women with children consistently won significant payments through the courts. For single mothers, where individual paternity could not be established, often all the men named by the woman as possible fathers were ordered to pay support. Abortion was made free and legal at any stage in pregnancy and laws giving the foetus human rights were abolished. With limited social support it was difficult for working women to continue to raise a family, given the poverty then endemic in the country. Russia thus became the first country in the world to introduce the legal right to have an abortion. This measure alone brought to an end that most horrid suffering and even death, through clandestine abortions, of both mother and child. Gender discrimination in hiring and firing workers was forbidden, prostitution was decriminalised and legislation gave women workers special maternity benefits. The Bolsheviks launched a movement for women's self-activity; the Zhenotdel, also known as women's section of the Communist Party. The Zhenotdel spread the news of the revolution, enforced its laws, set up political education and literacy classes for working-class and peasant women and fought prostitution. The new Soviet reality allocated a woman 2 major roles: a worker and a mother. That she had to perform in accordance with the official ideology and propaganda. For the years of Soviet regime these roles were obligatory for a woman to perform as they provided her a respectful status of a citizen. Yet their interpretation changed with the time. The civil war, 1921 famine and the introduction of controlled market forces in the New Economic Policy (NEP) combined with the backwardness of Russia's economy and its overwhelmingly peasant population slowed -down the Bolsheviks ambitious reform program and the movement towards women's emancipation. The socialisation of housework was postponed and many women began to lose their jobs. The nurseries and public restaurants, because of their low returns, were not an attractive investment for the nascent bourgeoisie that was coming into being under the NEP. Unemployment was rife and 58% of these unemployed workers were women. At times this figure would reach peaks of 80-90%, which led to the boost of prostitution in the country. 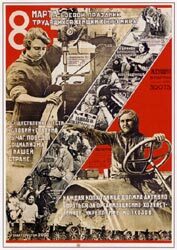 Under Stalin's policies of forced collectivisation and industrialisation, women poured into the labour force. Female labour became the symbol of the epoch. The collectivisation produced a great disproportion between the growing number of women Stakhanovites rewarded by the State and a great majority of peasant women that lacked access to most basic consumer goods and experiencing exploitation instead of modernization of collective farms. By the later 30th the women made the majority of peasants who worked on the collective farms as millions of men having fled to the cities seeking better opportunities. However by the end of the first five-year plan, the falling birth-rate and growing number of "unsupervised" children made the communist leadership move against the idea that the state should assume the functions of the family. Besides, the state appeared unable to apply its undertakings. The ability of Soviet women to make full use of their new rights was undermined by the inability of the government to rapidly solve the larger social problems of extensive poverty, unemployment and lack of social facilities. Thus the Bolsheviks decided to retrench. They found that the bourgeois family model very useful as it divided the working class into their respective family units, having to seek from within the family what the state was now unable to guarantee. The Stalinist bureaucracy now began to remove all the laws that had initially been introduced by the Bolsheviks to allow both males and females the full expression of their potential. In 1936, abortion, the main form of birth control, was outlawed, divorce went back to the courts, and the family unit was rehabilitated. 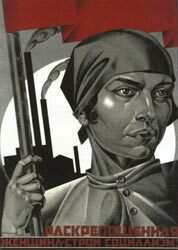 The forced march to creating a new industrialised Soviet Union required workers, and women were encouraged to reproduce. Official policy told the "worker-mother" to accept her double burden for the sake of mother Russia. By the 1940s, while Soviet women made up more than half of the waged work force, the cooking, cleaning, child-care, laundry - all aspects of the maintenance and reproduction of labour power - fell almost exclusively on their shoulders. The result was that the overwhelming majority of women became less able to participate in social, economic and political life, let alone on an equal basis with men. In 1944, the Family Edict eradicated the last remains of the 1926 code, withdrawing recognition of de facto relationships, banning paternity suits and reintroducing the category of illegitimacy. This tendency increased after the Great Patriotic war, that ended with grave USSR losses and demographic disbalance. A woman, very often a single mother has to bring up the children and reconstructs war-shattered economy. The Stalinist bureaucracy reinforced the family system for the same reasons it is maintained by capitalist society - as a means of submission to authority, perpetuating the division within the working class between man as head of the household and woman as domestic servant, encouraging the attitude of "each family for itself", and minimising the costs of social service provision. Even though the later reforms aimed at preserving the family institution and the earlier ones were focused on women emancipation the Soviet family represented unequal gender roles. The functions of a woman became more complicated: she was expected to be responsible for birth and children upbringing, took on the household, supported the family financially and plays her socially meaningful role. This was aggravated by the decades of males deprivation in Russia and Soviet Union (revolutions, emigrations, exile, numerous wars, repressions, expatriation, labour camps) and the necessity for a woman to undertake a male's roles not only in the family, but in the society as well. Even though the further Soviet reforms, especially after the Thaw and the Soviet constitution of 1977 made attempts to level this skew and confirmed the status of each citizen by his 2 major roles a worker and a family member despite the gender, the society did not totally refuse the idea that family duties are gender dependant. All these circumstances and historical changes formed the woman archetype, inherent in generations of Soviet/Russian women and quite common in today's reality.